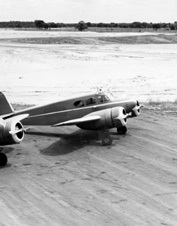 North Central Airlines was one of the largest and most profitable of the local service air carriers operating in the United States during the late 1940s through the 1970s. Though its route system was primarily focused on the upper midwest, North Central would eventually extend its reach to the east coast, south to Florida and as far west as Arizona. The story of this great airline began out of a need for efficient transportation in the small Wisconsin community of Clintonville. The Four Wheel Drive Company (FWD), a major manufacturer of four wheel transmissions and heavy duty trucks, desired a better way to transport their staff than the diminishing rail service or primitive road system could provide. A flight department was formed in late 1939 to fill this need with the purchase of a used Waco biplane. Another airplane was added to fill an ever increasing demand with many local businessmen riding along on a space available basis. This continued to the point where FWD executives decided that charging for this service was possible. Thus was born Wisconsin Central Airlines on May 15, 1944. 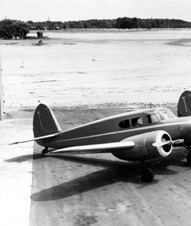 Former FWD advertising manager and now Wisconsin Central president Francis Higgins began an intrastate operation to six Wisconsin cities in 1946 with two Cessna UC-78 Bobcats. The purpose of this operation was to enhance the airline's chances of obtaining a new local service certification being offered through the Civil Aeronautics Board (CAB). The airline won approval for the 1400 mile, 43 city Air Mail Route #86 on the last day of 1946. The CAB would not allow FWD to own any stock in the new airline, so Higgins and newly hired 25 year old Vice President Hal Carr traveled to all corners of the system, including restaurants and taverns, trying to raise the nearly 1 million dollars required to start the operation.